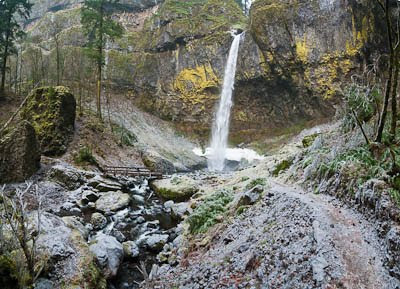 The Columbia Gorge in winter can be very wet, icy and enchanting, and, as a bonus, far less populated. Travelling with my son Gabe, we ate lunch, overlooking the gorge at the Ainsworth State Park exit, then spent the rest of an afternoon at the ever beautiful Elowah Falls. It was too icy to approach the falls without the right gear, but the overall scene was pleasant, cold and calm. Next we headed up to Upper McCord Creek Falls. We could see from below that there was plenty of ice, so we thought we would see if the trail was safe enough. 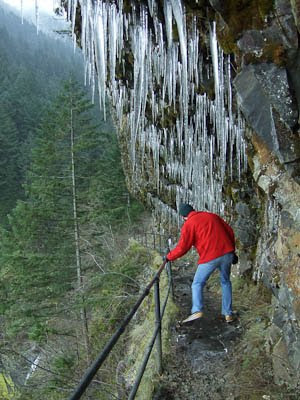 One really wouldn't want to do this with the ice and no hand rail, unless you had proper climbing equipment. We had to duck under the beautiful icicles, which also formed smooth ice under our feet. 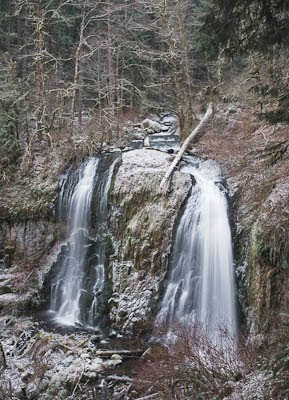 After dodging the icicles, beautiful Upper McCord Creek Falls was gently surrounded by ice, frost and a light snow.